Daily News Egypt 21 February 2016: When magicians perform a show, they usually impress the children watching by pulling a rabbit from a top hat, revealing a dove from their clasped hands, or drawing a never ending handkerchief out of their pocket. But for some children, all it would take to make them happy is to find clean, drinkable water pouring from their taps. The ultimate dream for more than 7 million people in Egypt is to have clean accessible water to use and drink, a dream that UNICEF Egypt is trying to achieve. 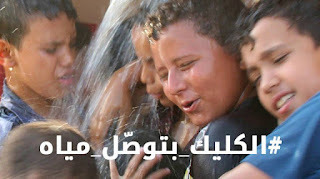 For the first time in Egypt, UNICEF started using click- funding in its campaign “Water for Life”. The initiative aims to provide access to safe drinking water for the poorest families in Egypt, to protect tens of thousands of...read on.